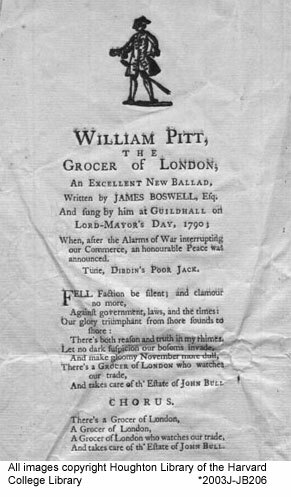 James Boswell’s noted love of the after-dinner ballad and his desire to secure political preferment combine in this broadside, William Pitt, The Grocer of London. After having tried unsuccessfully for several years to establish friendly relations with the Prime Minister, Boswell took the occasion of a feast honoring the installation of a new Lord Mayor of London to address William Pitt with this laudatory song. Combining news of a highly favorable trade agreement with Spain and Pitt’s honorary membership in the Company of Grocers, the song salutes Pitt for securing Britain’s commercial interests. Accounts differ as to whether Pitt was in fact present for Boswell’s performance of the song, on November 9, 1790, but there is agreement that it was a great hit with those assembled, who demanded five encores from Boswell. In any event, it failed to achieve its goal, as Boswell’s overture to Pitt was not reciprocated. This broadside, printed privately as a souvenir of the event, must have been produced in very small quantities, and this is one of only three copies known to exist today. This will be old news to British Johnsonians, but I just found out that the British Royal Mint last year issued a commemorative fifty pence coin for the 250th anniversary of the publication of Johnson’s Dictionary in 1755. In addition to the general circulation coin, serious collectors can spring for the gold proof. It is not, however, the first Johnsonian coin. Published in:John Overholt |on April 3rd, 2006 |Comments Off on Spare change, Mister?